On Monday, Transport for London - the group that looks after transport in London - banned any fast food advertising on their public services. This includes buses, trains and the London Underground, but even some taxis and roads. Many health campaigners have welcomed this ban, hoping it will promote a healthier lifestyle - particularly for young people. But some London residents are not so sure that the ban will do much. Why have junk food ads been banned on public transport? The logic behind it is the idea that if people see fewer adverts for junk food, the less tempted they will be to then eat junk food. There are lots of ads on public transport in London, and many campaigners were worried about the effect they were having. Now these ads will be banned on buses, trains and the Tube - but also on roads and taxis run by Transport for London. Celebrity chef, Jamie Oliver, who is a campaigner for healthier diets for young people, believes the ban is a good thing. Junk-food ads undermine any positive work we're doing in schools or at home to help kids eat well... So this policy is a massive step forward for child health. Fast food outlets are still able to advertise on transport - but the food they promote must be healthier options. For example, they may be allowed to promote reduced-sugar soft drinks, as opposed to full-sugar options. 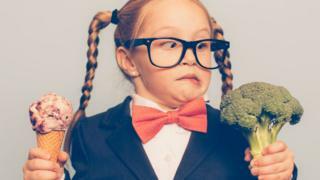 Would seeing fewer junk food ads encourage you to eat more vegetables? The Advertising Association are also not happy about the change. 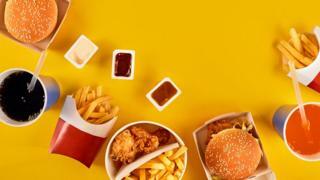 The UK has "the strictest rules in the world when it comes to advertising high fat/salt/sugar foods", said Advertising Association CEO, Stephen Woodford. He said the less big companies are allowed to advertise on London transport, means that fares for transport subsidised by adverts may go up. What do you think about the ban? Do you think junk food ads should be banned in other places? Or maybe you don't think they should be banned at all? I`m not really sure, to be honest. It don't think it will make a difference people will still eat at fast food places. It probably wouldn't affect people much because they already know about fast food and (if they live in London) they might know where the nearest McDonald's or KFC is.